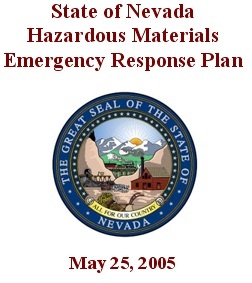 The Nevada Division of Environmental Protection (NDEP) is designated in the State Comprehensive Emergency Management Plan as the lead state agency for the clean up of hazardous materials incidents. The Hazardous Materials Emergency Response Plan was developed in cooperation with NDEP's support agencies to outline how State agencies will respond to hazardous materials incidents statewide. The plan outlines the roles and responsibilities of various state and federal agencies, the process by which local governments can request assistance, statutory and regulatory authorities, and an extensive contacts and communication section. Please submit any comments or changes to the Environmental Assistance Program Coordinator.